2015 / About Seatern / August: "Look no Seatern!" When Seatern was being built I spent quite a bit of time trying to come up with a layout for the masthead instruments which would give them all space while minimising the weight added. 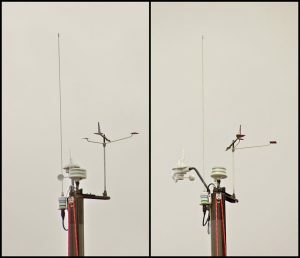 The task was complicated by my wanting to use a Shakespeare “Squatty body 5215” antenna which meant not using a combined Windex/antenna unit. 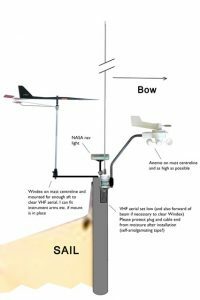 There was also the problem of accommodating the Echomax until Matt pointed out it could go on the boom gallows rather than the mast head. The final layout diagram I gave to Matt is shown left – but I think he may have lost it! When Seatern arrived the layout was more or less as specified except that the Windex mount extended to the starboard side of the mast rather than aft. The photo (right) shows views from astern and (far right) the port quarter. The problem with this layout was that the Windex was hidden by the mainsail when close hauled on port tack. During the period that Seatern was back with Swallow Yachts I altered the layout to the original specification (see left photo taken looking up from forward of the port beam). 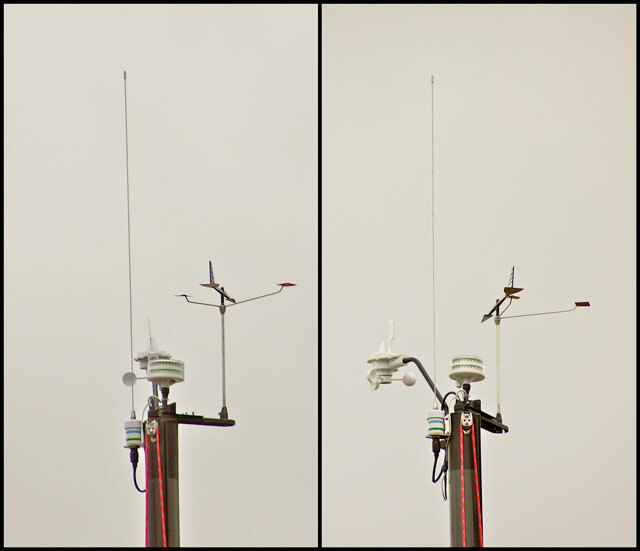 The top part od the mast is wood and the NASA Tricolor and the Windex mount were just screwed down onto it. I had to cut a small corner off the Windex mount but otherwise it all fitted OK. 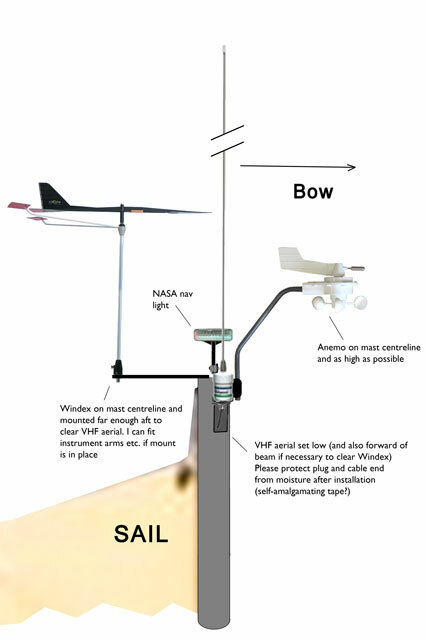 The VHF antenna might hit the Windex as it blows in the wind, but only on rare occasions.